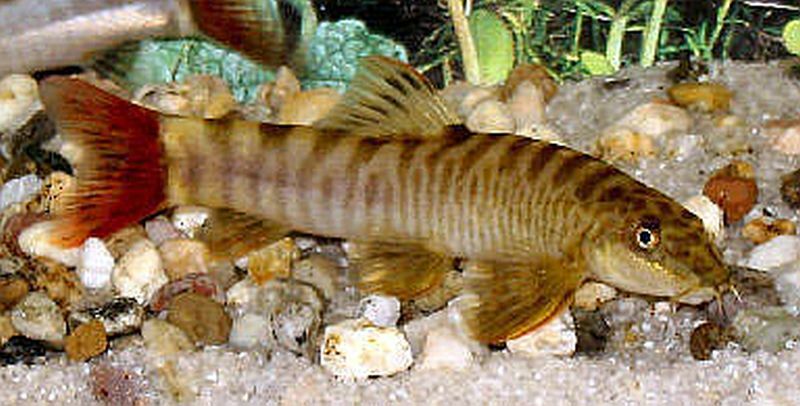 The Red Tail Zebra Loach (Schistura mahnerti) is a species of the stone loach family Nemacheilidae that inhabits the fast flowing, well oxygenated streams of Thailand and Myanmar. Schistura mahnerti are found in the Salween River which flows from the Himalayas eastward and forms the border of Thailand and Burma. In the Salween River the environment varies from slow to fast moving waters which are sometimes bordered by heavily vegetated shorelines where the fish opportunistically feed on insect larvae and plant matter. The Red Tail Zebra Loach is also known by tropical fish keeping enthusiasts as the Burmese Border Sand Loach, the Salween Hillstream Loach, the Red Tail Sand Loach, or Vietnam Red Tail Zebra Loach and is frequently misidentified in tropical fish keeping shops as the Zebra or Burmese Border Loach which are both members of the Botia genus. Red Tail Zebra Loaches have elongated bodies with flat bellies and a striped body pattern. They have at least 9 caudal rays and as the fish mature, their pectoral and caudal fins take on a strong reddish hue. They have a bold zebra type pattern of dark vertical bands encircling a light golden to silverish colored body. The bands are wider across the top and gradually narrow as they reach the mid-section and encircle the bottom. 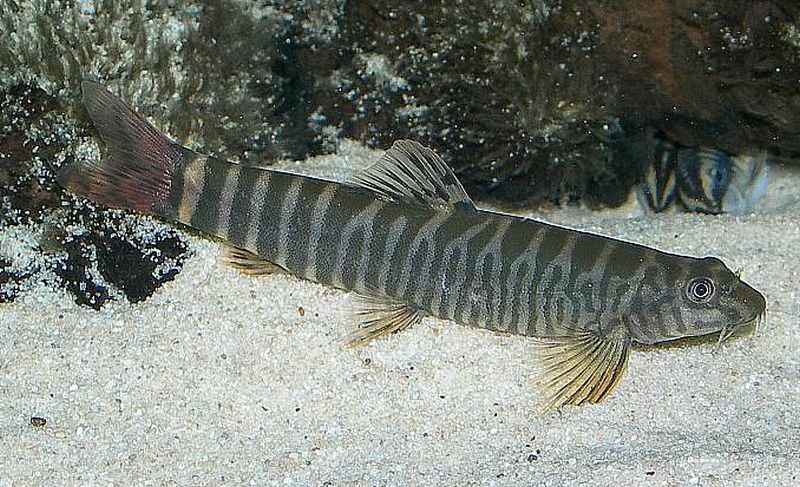 The striped body pattern is common to many Schistura species and resemble the split bands of the Zebra or Tiger Loach up front, but turn into thick solid bands towards the tail. The males also have suborbital flaps that are absent in some other species. Red Tail Zebra Loaches are best housed in a cooler “river” type aquarium environment with well oxygenated moderate water movement and subdued lighting. They prefer a sandy or fine gravel substrate with some water worn river rocks, some driftwood roots and a few shade tolerant plants like Java Fern or Java Moss for them to hide among and rest on. They require Weekly water changes of at least 30% to keep them healthy. An oversized water filter or canister filter and a powerhead should replicate their natural habitat. Like other Hillstream Loaches, the Red Tail Zebra Loach enjoys the company of at least 3 or more of their own kind. They do well in a community tank environment with other peaceful fish and usually only play among themselves, however, they are territorial and should be given hiding places where they can retreat to. Although Schistura mahnerti have been reportedly bred in Thailand, little is known of their breeding activity and to date they have not been bred in an aquarium environment. Feeding the Red Tail Zebra Loach can sometimes be tricky. In an aquarium environment they will eat all kinds of live foods such as mosquito larvae, small insects, bloodworms , brine shrimp, Daphnia , tubifex , snails and some vegetable based foods like Spirulina or algae wafers. They will also accept sinking omnivore tablets and cichlid pellets in addition to their live, frozen, or freeze dried food diet. Feed them small portions two to three times a day rather than one large portion daily. Although they are quite pretty, the Red Tail Zebra Loach is seldom available in tropical fish keeping shops. When available, they are usually 2″ to 2 1/2″ in length.